If you own a 3D Printer, there are the 10 essential tools and gadgets you need to make your life easier. Many people will have home made solutions but really, if you are going to do anything, do it properly. This article will show you the must have tools to make your life easier. Alternatively you can check out the 10 Essential Must Haves Video. 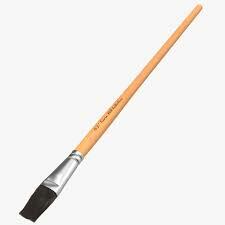 The first essential tool is the hand scraper. This cheap, no fuss device can not only save your builds but also your printer. While most people complain that their models don't stick to the plate very well, if you have set your machine up correctly, you will find it some times impossible to get the model off the HBP. 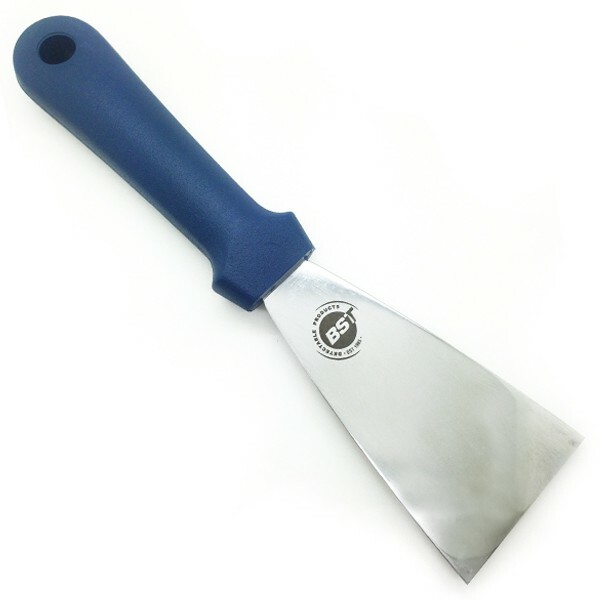 Those not armed with the humble scraper will look around for the nearest item that might do the job. This invariably ends up with damage to the Kapton Tape or worse, your build plate. Some may decide to 3D print a scraper to release the build object. Unfortunately the 3D scraper material is the same material as the object you want to remove, so it has a 50% chance of breaking. Another scraper task is to remove dags from your build plate. As all 3D Printer people would know, sometimes when you start printing, you realise there is a problem and need to cancel the print. This leaves a very fine layer of material on the plate which is even harder to get off than a stuck object. By just letting the weight of the scraper provide the force, you can easily clean off any unwanted material without damaging your printer. If you print in 1/100th of a millimetre, you should be able to measure to the same degree. I'm not saying your prints will be that accurate but it is nice to begin with as much precision as possible. 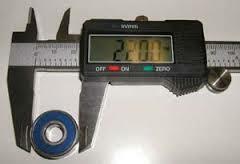 The most useful task the Digital Vernier can achieve is to measure the diameter of your filament. It might say on the box 1.75 mm but is it? When you model your object to gcode, calculations are made based on this diameter to instruct the extruder to pump out the right amount of plastic at the correct speed. If your diameter settings are wrong, you will get mixed results. Digital Verniers are also very handy when drawing your model, you can quickly get dimensions. Why digital? The old type of vernier requires counting off divisions, which may lead to errors. Digital Verniers can be easily read. If you want your prints to stick to the build plate, Kapton tape is the way to go. Generally 3D printers are shipped with the HBP already covered with Kapton tape. Unfortunately the tape can quite easily damage, which will leave unwanted lines/marks on the bottom face of your print. The good news is it is very easy to replace the tape and a roll is not expensive. 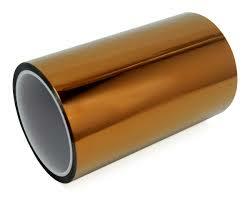 Check the Jetnet store for pricing and watch the video' How to Replace Kapton tape'. While 3D printing is pretty good when it comes to accuracy, when it comes to printing holes that are in the vertical plane or fiddly corners, you may get less than perfect results. The needle files can quickly clean up where the printer made mistakes. As a minimum you should have a round, flat and triangular file. If your build plate is not level, chance are you will have a bad print. Objects won't stick, angles will be skewed and worse of all, the nozzle may graze the kapton tape or worse, or HBP. The layman's way of levelling a build plate is by using a piece of paper. 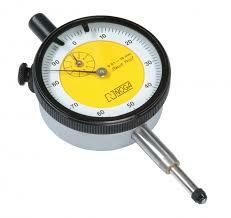 This does a 'pretty good job' but if you want accuracy, use a dial gauge. I have printed a mount that attaches to the cross bars which the dial gauge fits into. By sliding it over the plate you can get that plate precisely level. The STL file I made can be found under the projects menu or if you want, draw & print one yourself. Also see the videos of how to level the build place. You program your extruders to be 230Oc, your build plate to 120Oc. Your printer is telling you that they are at the temperatures but are they? Chances are No. The sensors rely on thermocouples which act as a resistive device to calculate temperature. Not the most reliable devices in the world. 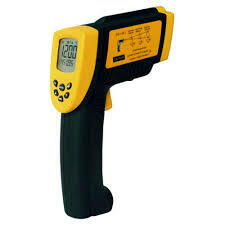 Using the infrared thermometer you can accurately determine the real temperature and apply an offset to your code. This means when you want to print at 230OC you will. ABS plastic can be dissolved by acetone which makes the stuff very handy. 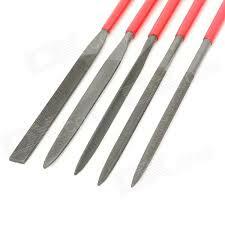 A nice sharp pair of side cutters is very handy and efficient for cutting filament. 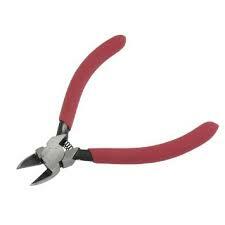 Scissors, pliers etc don't really play well with ABS, but electronic side cutters are the right tool for the job. Easy mistake to make. 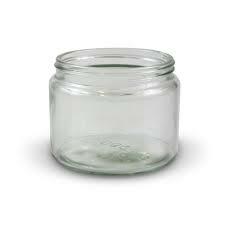 Put acetone in a plastic container. 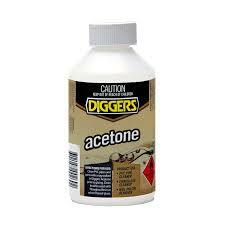 Bearing in mind we are using acetone to dissolve plastic... You get the picture. Most people avoid glass containers in their workshop due to the hazard and mess they can make if they break, but in this case, you will need to make an exception.